Large aperture for little money - that's always been the guiding principle for the purchase of a Dobson telescope. With the Dobson Black Diamond Skywatcher, a classic has been reinvented. Thanks to a sliding rod, the device is very easy to transport. 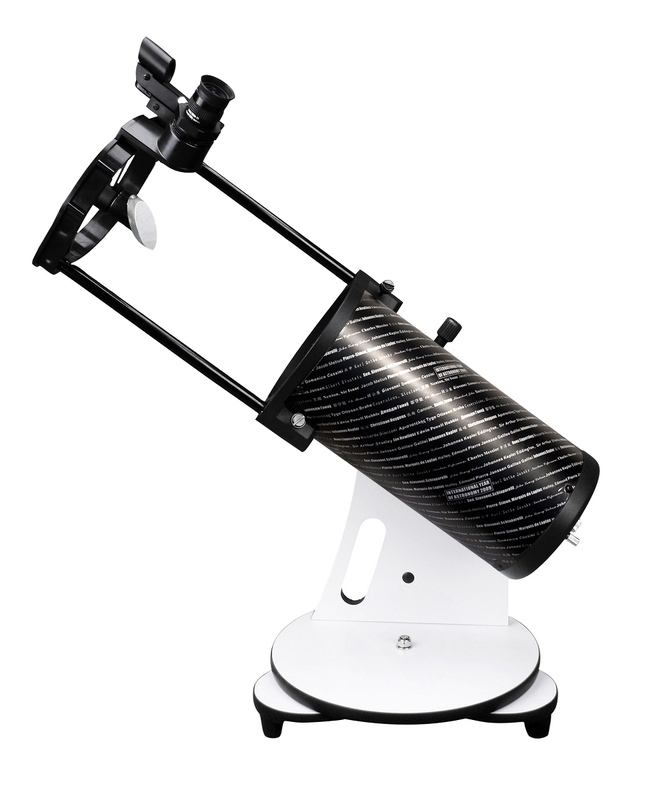 In addition, the flexible focal point can be moved via the sliding linkage.The optics Skywatcher N 130/650:This telescope is specially designed to celebrate the International Year of Astronomy (IYA 2009) as well as the anniversary of Galileo's first telescope. It's not just a high-precision optical instrument but also a beautiful collector's piece and ideal gift. The telescope tube is adorned with the names of many famous personalities who made a significant contribution towards promoting astronomy in the last 400 years, including Galileo Galilei himself.The core of the optical system is created by the same excellent parabolic primary mirror, which is also used in the larger Newton model. The telescope is an all-round device and offers a beautiful view of the moon, planets and the first deep sky objects. The patented grid tube system, it is very comfortable to carry and store. The position of the focal point can be flexibly adjusted. The uncomplicated handling of the Dobson mount is an excellent way to get started with astronomy as a hobby and it also has an ultra compact case. The complete telescope with mount comes fully assembled right out of the gift box.Most Dobson telescopes are only available from the 200mm class. This 130mm Dobson can be considered as an exception and is therefore an optimal travel companion. - Collectable International Year of Astronomy 2009 Special Edition. Perfect gift idea for the little astronomers or anyone curious enough to look up and wonder. As a serios amater astronomer I would reccomend this telescope to any beginner. It is easy to use and set up and comes complete with all you actually need. The only down side is the helical focuser (which holds the eyepiece), this is a bit flimsy and rattly (the smaller version of this scope has a crayford focuser) I wish that they had been able to fit one to this model. However, despite its shortcomings it does do the job and the aperture means that you can get a great sharp view of some deep sky objects. You will need to learn how to find your way about the sky to use it - but that is no bad thing and tremendous fun. This was bought as a gift for my 9 year old nephew for Christmas. It's a lot bigger than I was expecting it to be but that's not a problem. I'm still trying to set it up correctly as my family and I are all new to the world of telescopes and astronomy. We managed to see a few stars a few nights ago. We have also downloaded Skyview free to help us locate stars and planets. Unfortunately it was too early in the evening to locate Jupiter because of our location but we will keep trying.